1. Heat the oil in a large saucepan and add the cauliflower and fennel. Cook over a gentle heat, turning the vegetables frequently for 10 minutes until beginning to colour. 2. Add the thyme and stock and bring to a gentle simmer. Cover with a lid and cook for 5 minutes. Add the potatoes and cook for 8-10 minutes until all the vegetables are tender. 3. Tip in the cheese sauce, then the spinach, pushing the leaves down into the soup to wilt. Grate in plenty of nutmeg and cook for a further 5 minutes until the sauce is hot. Ladle into bowls and sprinkle with more nutmeg. Delicious served with warmed seeded spelt loaf or rolls. 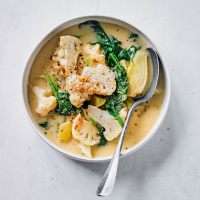 Cook’s tip For a spicy twist on this hearty soup, omit the nutmeg and add 1-2 tbsp curry paste such as Madras or Cooks’ Ingredients Tikka Masala.